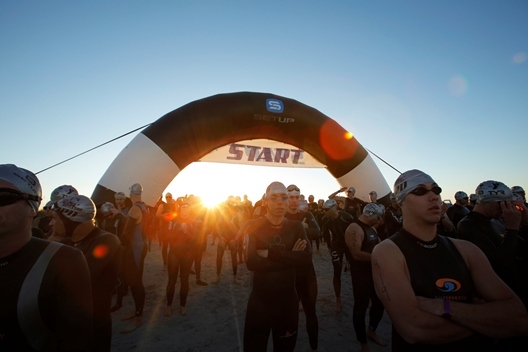 WRIGHTSVILLE BEACH, N.C. … Making waves, a record 1,875 triathletes will stroke the waters of Wrightsville Beach during the first leg of the internationally acclaimed Beach2Battleship Iron Distance Triathlon. From its starting point at Wrightsville’s south end Coast Guard Station on the eastern shore of BanksChannel to the finish line at the USS Battleship North Carolina on the west bank of the Cape Fear River, thousands of spectators are expected to crowd waterway beaches, channel banks, docks and bridges to cheer for and witness extraordinary feats of athletic endurance along the 140.6-mile route. The 2.4-mile swim through Banks Channel and Motts Channel begins at 7 a.m. and is expected to continue for approximately 1.5 hours, passing the docks of the Blockade Runner and ending at Sea Path Marina, the first of several key transition areas. Sprinting from Sea Path to Wrightsville Beach Park, athletes will mount their bikes and begin the 112-mile ride traversing Interstates, highways and country roads in four neighboring counties before arriving at Battleship Park. The final leg of the race is a 26.2-mile run across the Cape Fear River, through historic downtown Wilmington, around scenic Greenfield Lake and back. Named by Triathlete Magazine as one of the top five iron distance triathlons in the world, the field of participants represents 43 states and five foreign countries. Since the inaugural event in 2008, this year marks the first time the Beach2Battleship Triathlon, sponsored by PPD, has sold out. A total of 800 athletes are registered for the full iron distance race. Last year’s top time was 8 hours, 55 minutes and 52 seconds. An additional 1,075 athletes are registered for the half iron distance. The PPD Beach2Battleship benefits the Wilmington Family YMCA and the greater Wilmington and Wrightsville Beach area. Organizers anticipate 6,000 spectators, with as many as 2,000+ traveling to the destination. Spectators are encouraged to plan the three-day, two-night weekend in advance by booking overnight lodging and reserving meals. Witness the triathlon excitement, relax in Wrightsville Beach, and tour Wilmington’s historic flagship, the USS Battleship North Carolina. Other activities scheduled for the weekend include: Scenic nature tours with Captain Joe Abbate, the Carolina Naturalist, as featured in Our State Magazine; Halloween Horse Drawn Trolley Tours, “Avenue Q” at City Stage, the Model Railroad Extravaganza, Fall Camellia Show and Sale, and the 6th annual Cape Fear Wedding Show.